Water. You don’t really know how important it is until you don’t have any. A cold day turned even worse when I found out that the pump in our well needs to be replaced, hence no water for a few days. So what to do instead of shower and brush my teeth? Why visit a beer store I have never been to and pick out some goodies for the 365. Cheers to Oak Tree Wines & Liquor in South Plainfield, NJ, http://www.oaktreewines.com/, for having such a huge selection of beer from all over the world. If you are anywhere near South Plainfield, NJ, stop in and revel in the assortment they have for purchase. 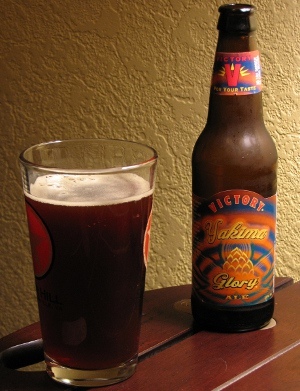 One of these goodies is beer #6, Yakima Glory by Victory Brewing Company. Categorized as a Black IPA or a Cascadian Dark Ale, basically an IPA with a dark appearance from the roasted malts. This particular version has a ABV of 8.7%. I switched up glasses and decided to use my Starr Hill pint glass for the tasting. The color was a dark brown with a tiny head. Into the glass went the nose, dark roasted malts along with hops, chocolate, a slight pine smell and a very faint coffee aroma I detected. To be honest, it smelled really good! The taste was hoppy and malty at the same time with a bitter finish. To me it had a slight chocolate aftertaste. It had a medium thickness mouthfeel with a good deal of carbonation. For having a high ABV, this is a pretty easy drinker. To be honest I was expecting so much more from this from the smell alone but it just isn’t something I was all that keen on.